Elliots Beach (aka the Besant Nagar Beach), or more commonly, Bessy is perhaps one of the cleanest beaches in Chennai. It is also a cool spot for the young and the restless to eat, chill and make merry during weekends. A prime residential locality in the city, Besant Nagar has been around since the time of the British. It is in close proximity to Adyar, another plush residential locality and a commercial hub of the city. This makes Bessy easily accessible by direct buses or any other mode of transport. The approach to the beach is simply beautiful. You could go through the calm Besant Avenue road, which cuts through the Theosophical Society and leads to the beach road. Elliots Beach lies towards the south of Marina Beach. There is a skating rink and a food court towards the south end of the beach, with a small theme park and gaming centres. At the centre of the beach lies the monument of Edward Elliot, after whom the beach is named. There is calm amidst all that chaos — the beach has many things to offer. The Broken Bridge being the most popular out of it all. The beach is filled with street food stalls which serve yummy bajjis , pori, ice cream and sweet corn. The other street food options include waffles, shawarmas, chaat, and momos. 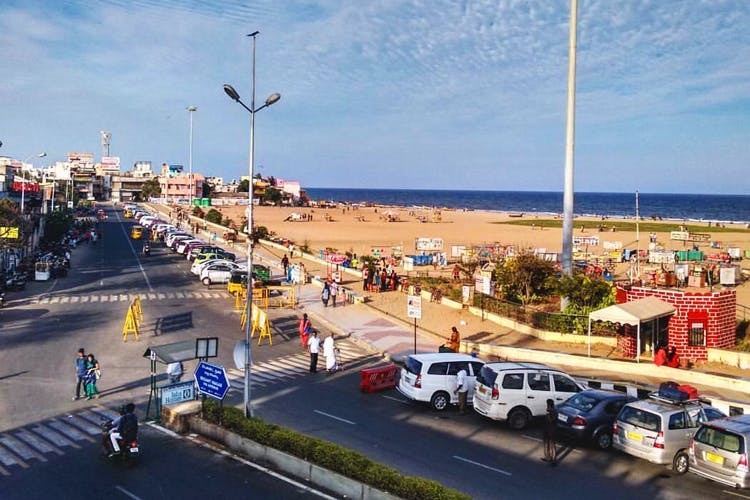 Apart from all the street food, sea-view restaurants, cafes, and bars are lined up right across the Elliots promenade, offering continental, south Indian, American and Asian cuisine. It will take you a few minutes to reach the beach from the commercial hub of Adyar. But the corporation provides ample parking space right across the beach for two and four wheelers. Make sure you make it to Elliots Beach at least once to capture the beautiful sunrise.